Welcome to More Restful Sleep! Do You Think You Have Apnea or Another Sleep Disorder? 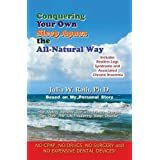 Don’t Just Live with Apnea; Conquer It Now! With NO CPAP, NO DRUGS, NO SURGERY, and NO EXPENSIVE DENTAL DEVICES! Julia W. Rath, Ph.D., was formally trained as a social scientist and public policy analyst. She has a doctoral degree in sociology from The University of Chicago and an M.A. in philosophy and social policy from The George Washington University, and was awarded a post-doctoral research fellowship in Behavioral Sciences Training from the Medical and Health Research Association of New York City in association with the National Development and Research Institutes. Dr. Rath has previously worked as a project director for a large-scale research study investigating the effectiveness of the delivery of health care services to underprivileged populations. Her specific focus was on the quality of treatment services for those with alcohol or substance abuse problems. She has also been a producer of radio and film. Currently a consultant in the area of health and human services research, she is a reiki master with interests in yoga, alternative medicine, and unconventional approaches to health and healing. She is currently working on a sequel to her book. Click on the Book to Order Your Copy Now!